Yesterday the ORR released the latest rail passenger statistics and (yet again) the numbers hit new records. The statistics relate to Quarter 4 (1 January 2015 to 31 March 2015) & show that over 1.6 billion passenger journeys were made, the highest recorded figure since the series of statistics began in 2002-03. In fact, passenger growth has been continuous for every year (bar 1) since 1992, as this chart shows. 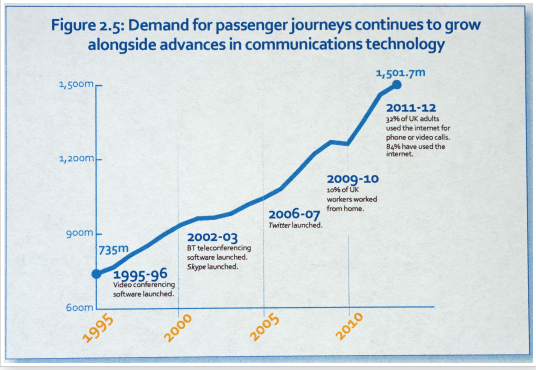 Mind you, the chart also exposes another of the anti Hs2 campaigns claims – that the internet, home working & teleconferencing et al will make Hs2 redundant. Looking at the latest figures in detail it’s clear that passenger growth is across the board. What’s interesting is the way that both Long Distance (LD) and regional services are growing faster than London & the South East. Long Distance growth is the area Hs2 antis always try & focus on to the exclusion of all else, so the figures for LD will particularly hurt them. Remember that 5.8% is 3.8% higher than the 2% growth projections used to justify the Hs2 business case. What’s also significant is the very strong regional growth of 6.1% which is the largest quarters growth ever recorded by these stats. Those regional services use many of the major hub stations like Leeds, Manchester Piccadilly, Birmingham New St & Sheffield that Hs2 will free up capacity at. If we want to grow regional services we’re going to need to add capacity to them – which is exactly what Hs2 does. Another sector that has registered very strong growth (9%) is the long-distance open access operators like Grand Central & Hull Trains. OA operators often struggle to get paths due to a lack of capacity on the East & West coast main lines. Yet clearly, there’s a demand for their services. There’s an obvious argument to allow them to grow (at little risk to the public purse) but there’s little chance of this happening without Hs2 creating capacity. Contrast these record passenger numbers with the utterly bonkers beliefs of Hs2 antis – like this.. Meanwhile, on another front, let’s have a look at how UK passenger growth compares with the rest of the EU. Clearly, the majority of EU countries would give their eye teeth for the level of growth that’s being experienced in the UK! Finally, let’s have a look at some long-term trends. 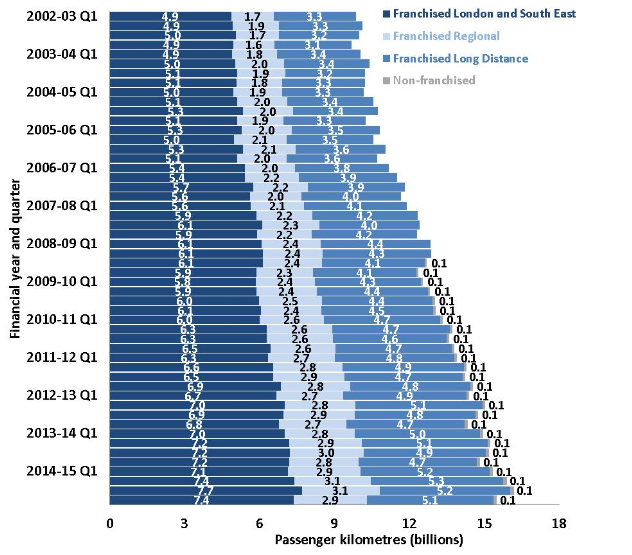 This is a chart showing the growth in passenger Kms (The number of kilometres traveled by passengers on the network) across all sectors between 2002 & the present day. From this it’s clear that not only has growth been continuous, but that it’s also accelerating. Despite all the evidence some still try & pretend we don’t need High Speed 2s capacity for the future. Is it any wonder their campaign has failed? Within a few minutes of the blog appearing, Bury based PR Nigel Sarbutts has responded on Twitter to provide a wonderful example of both the levels of intellectual bankruptcy & self delusion of the anti Hs2 campaign – not to mention why the world of PR has a reputation for a very uneasy relationship with truthfulness! But not to an anti in denial of course! Still, I should thank Sarbutts for handing me such a fine example of the anti Hs2 campaigns deceit & denial on a plate. Look how he’s changed the wording on his later claims..